By Rachel Held Evans, on February 01, 2012. Within the first week of my freshman year of college, my Introduction to World Literature class included a reading of Gilgamesh, an ancient Mesopotamian myth about a hero who is described as 1/3 man and 2/3 god. As we read the text together in class, I couldn't help but notice some striking similarities between this text and the familiar texts of Genesis and Ecclesiastes, but when we got to the part where Gilgamesh speaks with Utnapishtim, a survivor of the Great Flood, I disintegrated into a full-fledged faith crisis. So much of the Gilgamesh flood story sounded just like “my” flood story from Genesis: Both accounts included a boat in which just a few people, along with animals, are saved from a universal flood. In both stories, the boat comes to rest on a mountain and birds are sent out to find land. And both stories end with a sacrifice to a deity. And my literature book dated the writing of Gilgamesh before the writing of Genesis! I was at a conservative Christian college, and so my professor insisted that the texts had been misdated and that the story of Gilgamesh represented some sort of distortion of the historical/scientific account of Adam and Eve, Noah, and the flood. But my literary instincts had kicked in and I just wasn’t buying it. 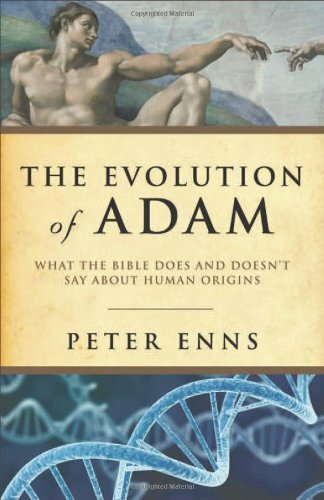 Twelve years later, Old Testament scholar Peter Enns has confirmed my suspicions, but in a way that has somehow managed to strengthen my faith rather than weaken it, through a fantastic book entitled The Evolution of Adam: What the Bible Does and Doesn’t Say About Human Origins. Enns goes on to remind readers that “a text’s meaning is rooted in its historical and literary context,” and to argue that the historical and literary context of much of the Old Testament can be found in the questions and concerns of post-exilic Israel. I first heard Enns present these ideas at a conference hosted by the BioLogos Foundation in 2010, and it was as if a light clicked on in my head. As a lover of literature, it made perfect sense to me that the best way to understand an author’s meaning is to study the time and culture in which the author wrote, to get a sense of the sort of questions people were asking at the time. Taking this approach to the Bible does not weaken it, but rather respects it for what it is, not what we want it to be. The Evolution of Adam not only answers just about every question I had after Enns’ Biologos lecture, but also includes a lengthy and thoughtful treatment of the apostle Paul’s Adam, again seeking to understand Paul’s intent within his unique context and culture. Enns is quick to note that it is Paul’s view of Adam rather than the Genesis account itself that causes most Christians to wrestle with the implications of evolution, and so it is Paul’s view of Adam that must be investigated. This may seem like an impossibly complicated topic to cover in a mere 147 pages, but Enns manages to do so with astounding clarity and insight. He is of the best scholarly writers I’ve ever encountered because he somehow manages to be thorough, personable, and readable all at the same time. For me, this book served as both a reality check and an inspiration—a rare combination that you just won’t find in most books that take historical and literary criticism seriously. I wish I could get into all the details of what made this book so helpful, but this would require a series of posts that will have to wait for a later time. For now, just know that The Evolution of Adam comes with my heartfelt, enthusiastic recommendation. Learning to love the Bible for what it is, not what we want it to be, means taking its context and history seriously. Enns has managed to do that in a way that both enlightens and encourages. If some of these titles sound familiar, it’s because most of them are on my list of books to read and discuss on the blog. So go enter!